Chambers Motors Ltd: 'A body building shop'. Hogg/Belfast. An unusual image today from the Mason Collection! 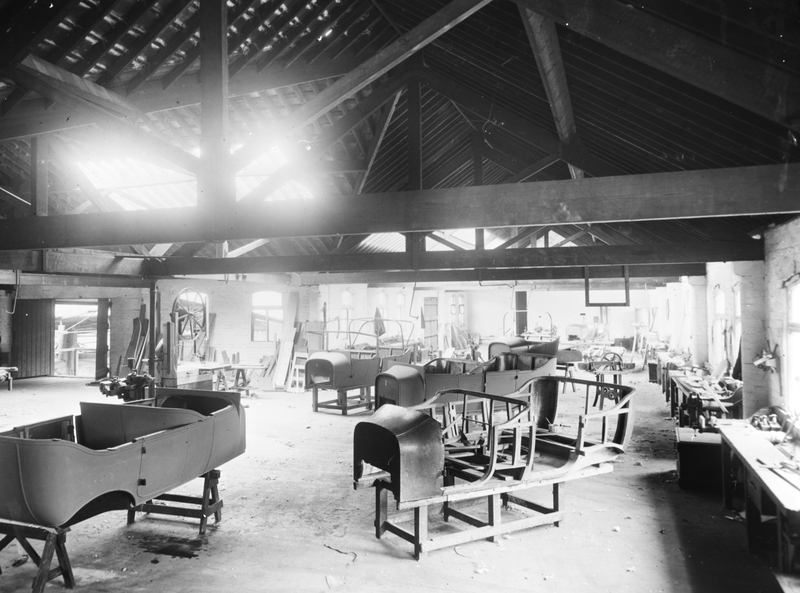 A body building shop in Belfast where Chambers Motors Limited apparently built the bodies of motor cars. When you visualise the robot assembled vehicles of today with those carefully assembled by craftsmen you can see just how much has changed in the meantime. What can we find out about Chambers and what cars were they assembling in this shop? In August 1905 Messrs Chambers & Co were described as having "of late devoted themselves with marked success to this new department, and claim to be the first motor car builders in Ireland" (Belfast News-Letter - Friday 11 August 1905) By 1907 they had changed to their "new title, Chamber Motors Limited" (Northern Whig - Thursday 22 August 1907) who "were the pioneers of motor-car manufacture in Ireland, and are still the only firm whore cars are wholly made in this country. Staring some eleven years ago in Cuba Street as general engineers, they rapidly won a reputation with their wiring machines, which are used by nearly all the large aerated water manufacturers and brewers in Great Britain and Ireland, and numbers of which are annually shipped for export. " (Northern Whig - Thursday 22 August 1907). I kow of several motor manufacturers which were originally bicycle makers (Singer, Rover, Humber) but this is the only one I've heard of which made brewing equipment. Based on the title of this accompanying photo the photographer was A.R. Hogg. The NMNI has a couple of photos of his of Chambers Motor Cars: 3-Seater with People; Empty 3-Seater. [https://www.flickr.com/photos/johnspooner] Also Pancake machines apparently! 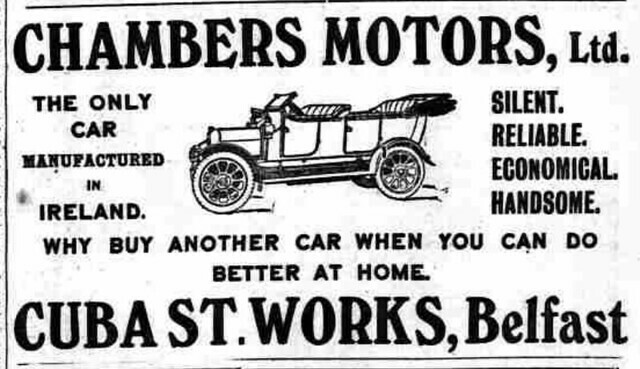 We can see from the photo what it looks like, but from the article in the Northern Whig, we can get an idea of the sound and smell (1907 new car smell). From here [the engine shed] one passes into the bodywork shed where carpenters are busy planing and hammering, and upholsterers are hard at work, while a dozen or so of bodies - some with brougham tops, others with dainty cape hoods, all smelling of paint and varnish - stand ready to be placed on the chassis. 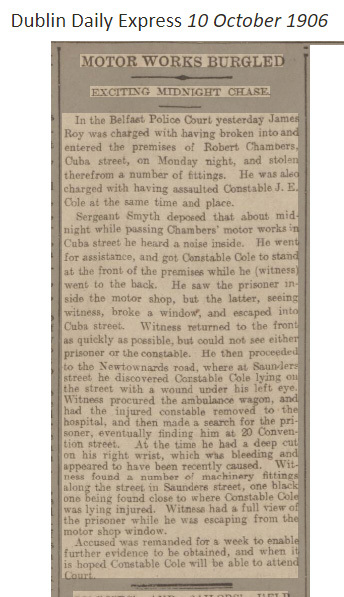 (Northern Whig - Thursday 22 August 1907). Cuba Street has been replaced by Cuba Walk. From my husband. He worked in Chambers one summer holidays back in the late 1950s as a mechanic. So he worked in this and in another workshop. One workshop was in Donegall Pass and another several streets along towards Ormeau Avenue. At that time they dealt with motorcycles. W.J. Chambers, Motorcycles, Donegall Pass. Fantastic Photograph and thank you for sharing here. I often look into old images like this and "wonder" what happened just after the image was taken. Willie John Chambers junior worked there too. He was involved in a major accident on the Ards circuit. Several big name motorcycling racers worked there too. I thought of Fred Flintstones footmobile when I saw the photograph. wikipedia says they got 43mpg in one model! newer isn't always better. firm closed shop in 1929... sounds like this is a gem of a find in your collection! A little bit more info from Grace's Guide, which thinks Chamber's Motors happened in 1908 - www.gracesguide.co.uk/Chambers_and_Co www.gracesguide.co.uk/Chambers_Motors "The Chambers brothers had been general engineers since 1897 and made cars from 1904 1904 Makers of the Downshire car The motorcar manufacturing company, Chambers Motors, then moved in from Cuba Street in east Belfast, where they had outgrown their existing factory. Chambers made cars of the highest quality but with certain eccentricities. Their gearbox, which was located in the rear axle, produced three forward speeds and reverse from an otherwise conventional epicyclic system using sun, planet and annulus gears. In 1908 the company became Chambers Motors During the first world war they built ambulances for the Ulster division but could not get government contracts due to the bore of their engines being too narrow. They also made shell cases and hand grenade fuses during the war. After the war, when supplies were difficult to obtain, they bought in many of their old cars, which had become outdated in bodywork styles but retained useful engines, and refurbished them as commercial vehicles."